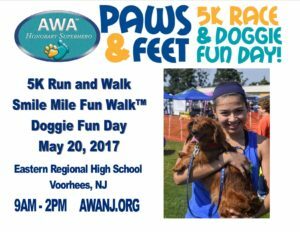 AWA’s Paws and Feet 5K Race and Doggie Fun Day is a community event celebrating the bond between humans and their pets. The day includes live music, food, activities, and games for the entire family. The festivities kick off with a 5K run and walk and a 1-mile fun walk, and concludes with a Doggie Fun Day on the grounds of Eastern Regional High School in Voorhees. Paws & Feet 2017 will be even bigger than last year! We have more fun and competition in store for you! Start forming your teams and telling people about Paws and Feet 2017.